Our Vertical Garden area was much smaller this year than the past couple years, but it still yielded some very interesting results. We focused mostly on melons and for the first time found a melon that seems to not adapt to the trellising. We tried two watermelons, the ‘Little Baby Flower’ red, seeded watermelon and the ‘Yellow Mini Tiger’ seedless watermelon. The ‘Little Baby Flower’ did very well, with lots of melons set that grew well and tasted great. They did crack when we had the rainy spell mid-summer, but that isn’t abnormal. The melons were okay on the trellis, although it was better to tie them up somewhat. It was also easy to identify ripe melons by looking at the nearest tendrils. The ‘Yellow Mini Tiger’ had problems from the outset. 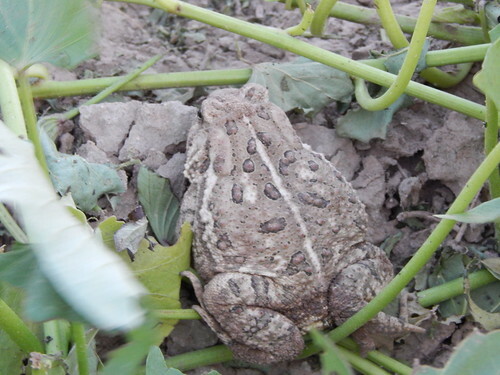 As a seedless variety, we needed to plant the variety seeds and the pollinator seed. The pollinator grew readily, but we had to plant all 10 of the variety seeds to get a single plant growing. That wasn’t an auspicious start! We finally had one plant growing, after a few weeks. As the summer wore on, we had melons set on both the pollinator and the variety vines. Unfortunately, the melons were just large enough and the vines just brittle enough that they kept falling off the vine before they were completely ripe. Maybe we waited too long to try tying them up, but we lost a number of melons to breakage. 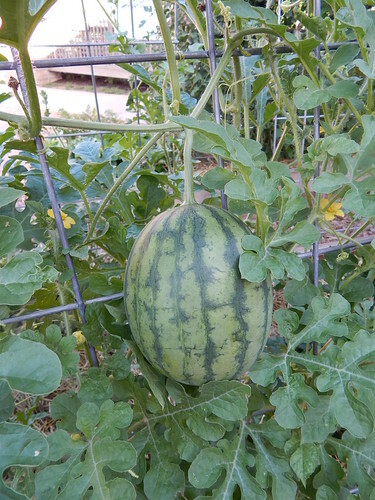 The vine didn’t set nearly as many melons as the ‘Little Baby Flower’ and we never got a fully ripe melon. So…not so much a winner, at least on the trellis! The other melon trellis was some more specialty melons, with the ‘Sun Jewel’ Asian melon and the ‘Snow Leopard’ honeydew melon. Both of these melons did relatively well. The honeydew was fairly productive, especially once we got the hang of knowing when they were ripe. It wasn’t as productive as some of the cantaloupe varieties we’ve grown in other years, but was still good. (The ‘Snow Leopard’ honeydew was a white fleshed melon.) The ‘Sun Jewel’ Asian melon was very productive, although it cracked in the rain and then slowed down a lot later in the summer. The thing with the ‘Sun Jewel’ melon is that it is different from what we expect of a melon. I was telling everyone that if you thought of it as a melon, you would be disappointed in the flavor, but that if you expected it to taste like a sweet cucumber it would be enjoyable. 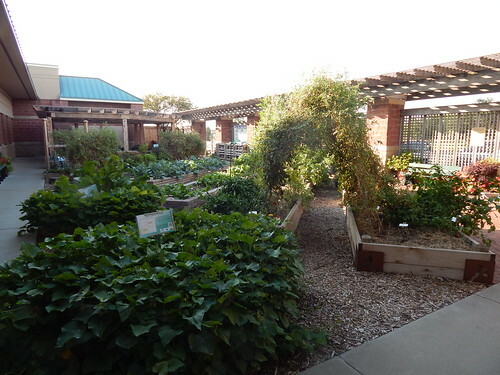 The last part of the Vertical Garden is the vegetable arbor. I’m only going to talk about the two varieties that were on the Vertical Garden side in this post. I’ll save the other two varieties for my discussion of the Kids’ Snack Garden. 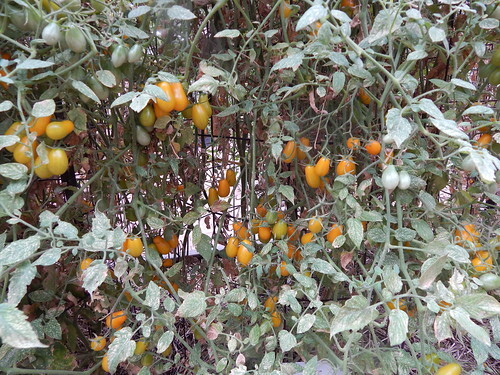 The ‘Golden Honey Bunch’ cherry tomato and the cucumber were on the Vertical Garden side of the trellis. The cucumber – well, I doubt it was the fault of the individual variety. We just didn’t get it up and growing in a timely fashion. We ended up trying a couple different varieties and still struggled with germination. 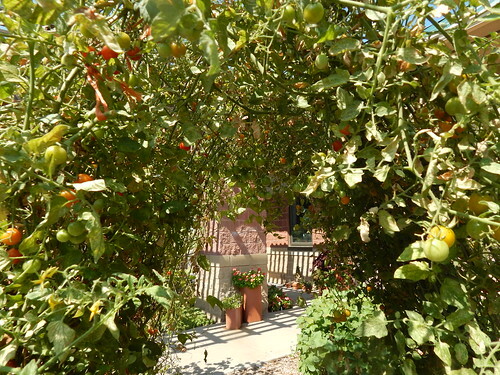 Not that it mattered…the tomato completely filled the trellis all on its own! The ‘Golden Honey Bunch’ was a real star in the garden this year! The tomatoes tasted great and the production was spectacular. As of writing this post (Thurs. AM), we haven’t gotten a significant amount of rain in the Demo Garden this week. I know some of you in other parts of the area have gotten more. Here’s hoping that we’ll get some good rain either this afternoon or tomorrow! Yet again, you can see the gradual decline of the tomatoes. I had a conversation with a garden visitor this week, where I told her that I would rather have ugly tomato plants with great tomatoes than pretty plants and no tomatoes! We are also starting to take a few plants out here and there. One of the trellises is completely empty now! 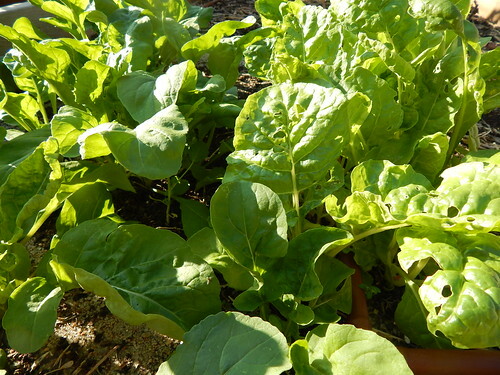 The arugula and Swiss Chard in the pizza garden is just about the perfect size for salads right now, and I would imagine they would also be good on a pizza! Yum! 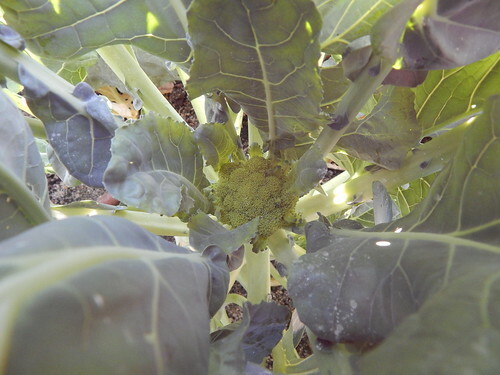 The fall brassicas garden is growing like crazy, although the caterpillars are still munching like crazy too. Actually, they aren’t as bad at the moment. There is some feeding damage on the new growth, but nothing like it was earlier. And there are still those annoying little white butterflies flitting around. I’ll be happy when I quit seeing them! You can clearly see the effects of the spider mites on those leaves, but they sure don’t seem to be slowing down the production of these grape tomatoes. After all we harvested on Tuesday, I still got another half gallon of tomatoes today. Yikes! There are also some that I just can’t reach because of the way the tomato cages and vines are intertwined. This cool looking moth was hanging around the garden this week. 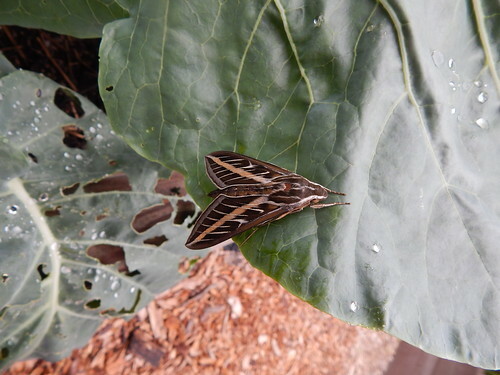 I am pretty sure it is a Whitelined Sphinx Moth, which is supposedly the most common sphinx moth in Kansas. Apparently the larvae mostly feeds on weeds. 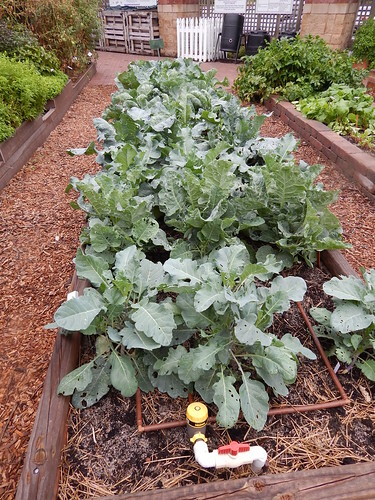 If it lays its eggs on the cabbage, those caterpillars won’t be happy (since we treat for caterpillars), so I hope it was just visiting. The Lunchbox peppers have been doing pretty well all summer, but they are going crazy now! 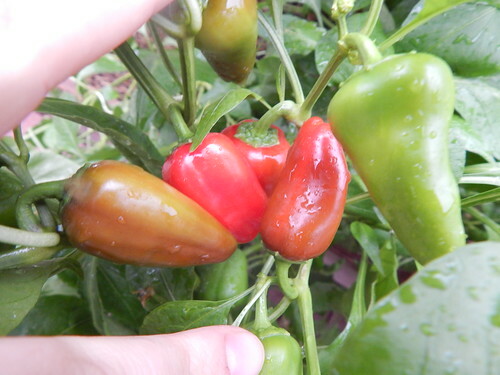 They are very productive, especially compared to the Yummy peppers we’ve tried in the past. 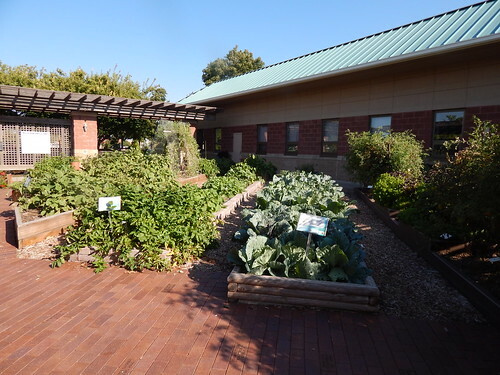 Our last Saturday Sampler of the year will be this Saturday, September 21st at 9 a.m. here in the Demonstration Garden. 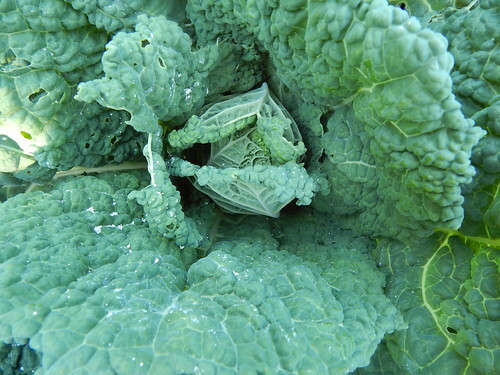 We will be featuring fall vegetables in the recipes and discussing fall gardening techniques. Also – bring your ideas for topics you might like to see next year! 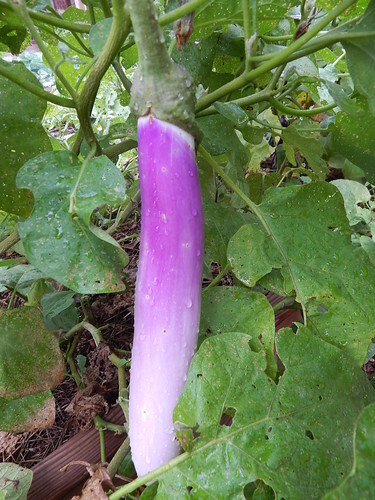 In reality, the results of the eggplant trial are pretty straightforward. Almost everything did pretty well, and they are still producing now, despite being left to the onslaught of insects for the last month. Millionaire – Long, dark purple Asian type. This was the earliest producer and was in clear competition with Green Goddess for highest yielding. The skin was fairly tender. Green Goddess – Long, green skinned Asian type. This variety was fairly early and very high yielding. It was probably a little higher yielding than Millionaire, but it was hard to keep track. The skin was nice and tender and the flesh had a very sweet, floral scent. Orient Charm – Long, white and lavender Asian type. This one was more uniformly skinny than the other two, but it also had tender skin and excellent yields. Traviata – This is the traditional purple Italian type. It did have a tougher skin than most of the others, but it yielded well and the fruit looked good. Clara – This was the traditional white Italian type. It did well, although was a little later to start producing. The fruit quality was good and yields were good. 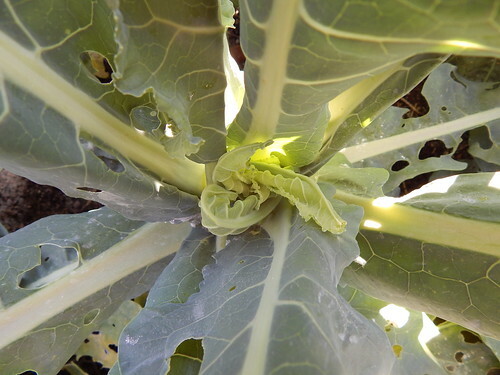 Calliope – This variety started out fairly strong but didn’t maintain good yield throughout the summer. The plants were smaller, so it may just have gotten overshadowed by its larger neighbors. If you want a smaller fruit size, this one might be worth another try. Rosa Bianca – This heirloom was the lowest yielding of all the varieties and the fruit was definitely an odd shape. If those are concerns for you, then this may not be the best choice.